This sandbox is currently being used to provide more details about the Shivering Isles game guide, specifically errors (when in doubt, UESP details take precedent). 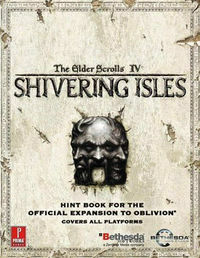 The Elder Scrolls IV: Shivering Isles - Prima Official Game Guide is the official hint book for the Shivering Isles expansion for Oblivion and its official plug-ins. The guide was written by Peter Olafson and published by Prima Games in 2007. Complete maps for the Main Quest and the realm of Sheogorath. Walkthroughs for every quest in the expansion, including the Main Quest and Freeform Quests. Detailed bestiary chapter to help you best deal with the strange denizens of the Shivering Isles. Complete sections for all new items, ingredients, and more. Includes full coverage on Knights of the Nine and Oblivion Downloadable Content. This section contains quotes from On Oblivion and Varieties of Faith in the Empire, followed by a brief summary of what strange sights and encounters you may find in the expansion. The quote of On Oblivion in the guide spells Coldharbour as "Couldharbour". Nor does the guide actually quote the book word-for-word, rearranging parts of sentences, changing wording, or leaving out entire parts of sentences altogether. This section lists every new ingredient and flora introduced in the expansion, as well as from what they can be harvested, their effects, how many of each source of ingredient exists, where they can be commonly found, and the percentage chance of harvest. The guide uses the term "# of plants" to describe how many of each source of ingredient there is, including non-plant containers. The guide calls Hearts of Order "Knight Hearts" and Bone Marrow "Shambles Marrow". The guide claims Void Essence has as Fortify Speed effect, when it actually has a Fortify Strength effect. The guide lists the order of every ingredient's alchemical effects incorrectly. It claims there are 314 Alocasia plants, when there are only 301. It claims there are only 21 sources of Ashen Remains, when there are 22, and it can be harvested from the Alkanet plant, when it actually can't be harvested from any creature or plant. It claims there are 118 Aster Bloom plants, when there are only 117. It claims there are 904 Mushroom Tree Saplings and Black Tar plants, when there are only 893. It claims there are 310 Blister Pod plants, when there are only 304. It claims there are 195 Putrid Gigantea, when there are only 194. It claims there are 817 Fire Stalk plants, when there are only 752. It claims there are 817 Fungus Stalk plants, when there are only 814. It also claims a concentrated amount can be found at "Gloomstone Passage", a location that doesn't exist in the game. It claims there are 1,036 Grummite Egg Mounds/Sacs, when there are only 836. It also claims a concentrated amount can be found at "Xilera", a location that doesn't exist in the game. It claims there are 439 Hydnum Azure plants, when there are only 437. It claims there are 223 Letifer Orca Planta, when there are only 220. It claims there are 673 Red Kelp plants, when there are only 666. It claims there are 97 Rot Scale plants, when there are only 93. It claims there are 123 Screaming Maw plants, when there are only 103. It claims there are 84 Thorn Hook plants, when there are only 76. It claims Unrefined Greenmote cannot be sourced from a plant, when it can be found on Mushroom Tree Saplings, a total of 337 exist, with an 80% harvest chance. It claims there are 54 Watcher's Eye plants, when there are only 50. It claims there are 171 Water Root Pods, when there are only 166. It claims there are 858 Root Stalks, when there are only 829. It claims there are 1,079 Withering Moon plants, when there are only 1,044. Finally, it claims there are 414 Worm's Head plants, when there are only 409. This section lists every piece of Amber and Madness armor, Amber and Madness weapons, and several spells introduced in the expansion, as well as their stats. The guide claims the Grand Amber Helmet has a weight of 4.5, when it has a weight of 2.8. The guide swaps the enchantments of the Lesser Madness Gauntlets and the Lesser Madness Helmet. The guide claims the Madness Shield costs only 335 Septims, when it costs 336. The guide claims the Madness Greaves only have a weight of 25, when they have a weight of 25.5. The guide claims the Fine Madness Shield has a weight of 19.6, when it only has a weight of 19.5. The guide claims the Grand Madness Gauntlets only have a weight of 11.3, when they have a weight of 11.5. The guide claims the Grand Madness Greaves only cost 1,625 Septims, when they cost 1,675. The guide claims the Grand Madness Helmet only has a weight of 11, when it has a weight of 11.3. The guide claims the Perfect Madness Helmet only has a Fortify Willpower 10pts enchantment, when it has a Fortify Willpower 12pts enchantment. The guide claims the Perfect Madness Shield has a weight of 24.8, when it only has a weight of 24. The guide claims the Salve spell has a Restore Health 15pts effect, when it only has a Restore Health 5pts effect. This section lists every creature and several humanoid enemies that can be encountered in the Isles. This section contains a walkthrough for the entirety of the main quest line in the Shivering Isles. During the Through the Fringe of Madness section, it claims following the Overlook Road will lead you to Crucible, the southern district of New Sheoth, when it is actually The Low Road that will lead you to Crucible from the south. The guide considers Baiting the Trap a part of the quest A Better Mousetrap. This page was last modified on 5 March 2019, at 09:05.